Common Good consists of the historic land and property owned by Scotland’s burghs. In 1975, local government in Scotland was abolished and replaced by district and regional government. Title to the assets previously held by Scotland’s town Councils was transferred to the Districts but its unique legal status as common good remains to this day. Two reports might assist in understanding the topic. The first, Common Good Land in Scotland. A Review and Critique, reviews the topic and a survey conducted in 2005. I conducted a further survey in 2009 and am in the midst of one in 2012 and hope to publish findings as soon as possible. 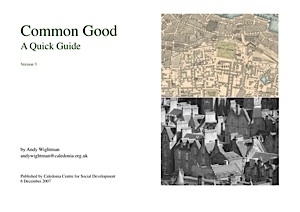 The second is a Quick Guide to Common Good which does what it says in the title.